I grew up under a mantra: “Girls can’t… whatever.” I don’t even remember being asked what I wanted to be when I grew up. People didn’t ask girls that question in the 1950s. At least, not where I grew up. I wasn’t aware—not consciously—of living under any restrictions, but they were there all the same, looming over me like a huge, tightly clenched fist. I didn’t feel sorry for myself, it’s just the way it was. To be fair, being a surgeon was out because my parents couldn’t afford to put me through medical school, and being a jockey was out because they also couldn’t afford the upkeep of a horse, never mind jockey school. They could, however, afford to get me some of the tools I needed to make architecture a hobby. My mother telling me you can’t was her way of saying they couldn’t afford… whatever. I’ve always had a certain house in mind. A dream house, if you will, a house I’ve designed over and over both in my head and on paper. 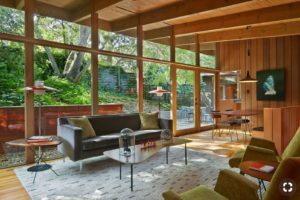 Before the mid-to-late 1960s I’d never seen an architectural style like it, but I have to admit, the vision morphed and redesigned itself through the years as I borrowed elements that I found attractive in any given era. So, here are some names for you, Mom. Dr. Elizabeth Blackwell (1821–1910) – First female US surgeon. There have been many, many women who followed in the footsteps of these pioneers. SK Waller is an author and composer. Books One and Two (With A Dream and With A Bullet) of her rock and roll series, Beyond The Bridge, takes places in late 70s London. Read more at SK Waller SKWaller.com.